It was a mythological atmosphere at Dolce Gabbana’s Menswear spring 2014 show. 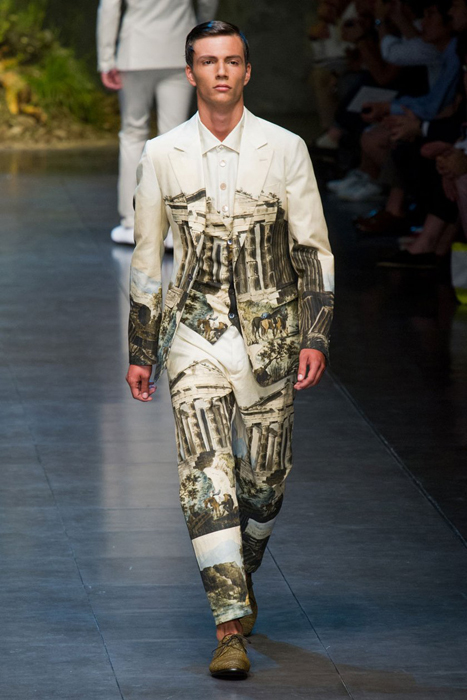 So many ancient Greek prints accessorized the hunky male models we’re so prone to see at D&G shows. It’s a vast collection of tops, shirts, trunks, tanks and killer suits. A large olive tree backdrop covered the runway, perhaps a symbolic response to the controversy surrounding the duo as of late. Subdued but powerful, if looks could kill, we’d all be victims to this suave collection. The bold prints showcase temple etchings, antique coins, and the faces of Greek Gods like Zeus and Apollo. Sicily (Dolce’s birthplace) is obviously represented in many of these pieces. It’s like taking a vacation to the ancient time of warriors and philosophers. Another key point in this line are the handsome double-breasted suits in lively shades of red, blue, amber and classic black and white. A dapper pin-stipe suit is also crazy suave. Guys will make the ground sizzle when they walk in these fantastic looks. Now, that’s a suit!